Since my original post on Monday I've made some small adjustments to my AAPL 4th fiscal quarter estimates. The adjustments include the reallocation of certain revenue expectations from the Other Music segment and slight adjustments to certain hardware ASPs. Below are the updated estimates. Macintosh unit sales growth continued at a strong 30% pace, iPhone unit sales increased roughly 67% in the September quarter, Apple iPad unit sales rose more than 80% sequentially due to expanding global availability and support from enterprise and education adoption. Additionally, I anticipate strong growth in iTunes-related revenue due to the popularity of Apple's iOS-based devices. My revenue estimate for the 4th quarter of FY 2010 is: $21,486,228,989. The estimated revenue total is based on my trend analysis and accompanying formulas. In preparing estimates the focus is of course on the dollars. But one of the things I find most intriguing is the changing revenue mix that will deliver record revenue and earnings per share for Apple in the quarter. Revenue from the Apple iPad and the iPhone, two products that did not exist in the marketplace as recently as three and one-half years ago, represent 55% of my estimated revenue for the quarter. I estimate Apple's cost of sales at 61.25%, with a resulting gross margin of 38.75%. This is slightly below the June quarter's gross margin of 39% and below the average gross margins of the most recent three-quarter and seven-quarter periods, but it well above Peter Oppenheimer's guidance of 35% for the quarter. I suspect margins are pressured by the aggressive pricing on the Apple iPad and perhaps costs related to the Apple iPhone 4. However, there are other factors, including strong sales of accessories and services that offset these costs relative to revenue. I estimate OpEx (operating expenses) at about 11.4% of revenue, inline with the recent expense trend relative to revenue for the previous three fiscal quarters. These expenses are influenced by stock-based compensation costs and the continuing buildout of the company's retail stores and other revenue support infrastructures. I estimate Apple's tax rate for the quarter at 26.25%, slightly below guidance of 26.5%. Due to the rising percent of international sales in the company's overall revenue mix, Apple's tax rate should continue to be attractive, adding measurably to the company's net income and earnings per share performance. For the quarter I estimate net income of $4,378,156,676 or earnings of $4.70 per fully diluted share. I had some formatting issues on this post and resolved the issue of the missing graphic. It's been restored. Great info and very well presented! Nice job! Question - how do rationalize such high growth in iPhone given the constrained supplies that have been seen through the quarter? Supply only recently has seen improvements in the US but we are now in FQ1? Do you see this rate as a high risk in your model? I don't consider the iPhone estimate of roughly 67% unit sales growth particularly high. For the first nine month of the fiscal year iPhone unit sales were running at better than 90%, inclusive of the June quarter's 61% unit sales growth due to the drawdown of 3GS inventory in the second half of the quarter. There are expanding points of sale and an expanding Apple retail store presence. European sales should remain strong and the popular 3GS handset remains in the mix. The halo effect of Apple's multi-product paradigm is also a benefit to unit sales. Constrained supplies are indicative of rising sales. My estimate suggests a pace of sales growth not much above the June quarter's performance due to an inability to satisfy channel demand before the end of the quarter. Robert, you're modeling iTunes to grow almost 90% from last year? That would be a stark departure from the historic iTunes growth. 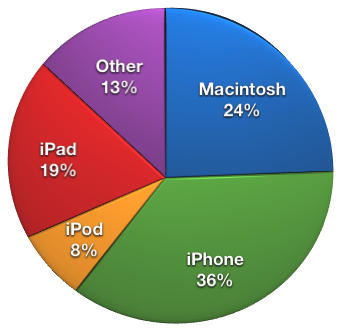 I don't think the quick iOS device adoption and related new sources of revenue (apps, books, etc.) are enough to justify 90% growth. You sure there's not a typo or funky formula somewhere? Thanks for the feedback. If there's one category where I do see a big jump in revenue activity it's iTunes. In the September quarter I'm estimating 18.3 million units between the iPhone and the iPad alone. Add in more than 4 million units sold of the iPod touch and we are well over 22 million additional iOS devices in the market by the end of the quarter. What's unique to the Apple iPad is many productivity titles available through iTunes justify a higher cost and thus a much higher yield for Apple. I'm not sure how Apple will assign iAd revenue nor the revenue for its own productivity apps. I suspect the Apple iPad will generate far more after-purchase revenue for Apple on average than other iOS-based devices. The estimate is high. One of the challenges in working with formulas is remaining consistent and avoiding the urge to make subjective (or arbitrary adjustments) when the outcome is surprising. We'll know more following the September quarter as to the revenue growth trend for iTunes in the Apple iPad era. Higher priced apps, the addition of electronic book sales and the continuing proliferation of iOS-based devices should yield much higher revenue from iTunes each quarter. As for my purchases, I have invested more in iTunes apps in the three months since I purchased an Apple iPad than I had spent in the three years prior for my iPhones. Thanks for confirming, and I'm rooting for it even if I'm skeptical. Thanks for looking through the numbers. This weekend I will be posting a slight revision to my overall outcome. The net effect is a slight drop in revenue to about $21.485 billion and eps of $4.70. I'll detail the slight changes on Saturday. Some of the estimated revenue has been reallocated to different sources but the changes overall are quite small. On the issue of operating expenses (opex). I've struggled with the numbers. I have a comprehensive analysis of opex trends for the most recent three quarter and seven-quarter periods. Operating expenses have trended higher with revenue and fairly consistently track with revenue growth. This is expected of a company in a significant phase of growth and development such as Apple. What makes Apple much different is that it's a mega cap and few companies of Apple's size experience this level of growth. The rise in operating expenses suggests continued growth in sales support and infrastructure. I don't find this to be alarming in any way. As was discussed in the Apple Finance Board, a component of operating expense is stock-based compensation. That expense is not necessarily tied to revenue growth but may be indicative of strong share price performance. Considering the pace of new Apple retail store openings, new product development and growth in global distribution and sales, I expect operating costs to rise in support of revenue activity. My opex ratios are slightly below the 3rd fiscal quarter's ratios. In my revenue and expense forecasts I factor the popular iPod touch promotion for students as a GS&A expense, not a reduction to revenue. I believe that's the appropriate way for the promotional expense to be realized. Advertising activity is also most likely higher this quarter due to ad support of the iPad rollout in the domestic and many international markets.